“Welcome to Walmart” has been a familiar phrase to many a shopper as they strolled in through the front door at Walmarts across the country. But that’s ending next month. Walmart greeters are being discontinued. According to a report from Bloomberg, greeters working the third shift, 10PM to 7AM, have been reassigned to other positions over the past 6 months. Now they are reporting that greeters during the day shifts will be reassigned as well, starting in February. The move is being done, said Walmart Spokesman David Tovar, in an interview with Bloomberg, as a way to cut costs and prices. Walmart first began having greeters at the door in 1980, at the behest of Sam Walton himself. Walton felt that the hospitality would set Walmart apart from other retailers. Many retailers co-opted the idea. 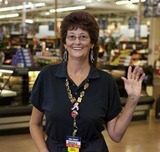 Still, Walmart greeters became an icon, there is even a Facebook page dedicated to them – with over 7,500 likes. Of course, Walmart greeters didn’t just greet customers. They would also monitor and sometimes check receipts as customers left the store. At times this led to violence. The day after Christmas, 2009, a customer threw a fist at a 69 year old greeter in Palm Bay, FL. The customer was arrested, and the greeter lost his job because he swung back. On Christmas eve 2011, a customer punched a 70 year old female greeter at a Walmart in Batavia, NY. That customer was caught and detained by customers, then arrested when police arrived. A Walmart greeter in Boston, 53 years old, died after being shoved by a shoplifter, striking his head. The shoplifter was caught and was sentenced to life. Another, a 100 year old woman, was shoved to the ground by a customer in Milwaukee in 2010. That customer was arrested and charged with battery to a person over 62. CP has asked Walmart if greeter safety played a role in the decision to discontinue the greeter program, but we have not heard back from them at publication time. We will update this story when they respond. Tovar told Bloomberg that the former greeters would be assigned to areas near the cash registers to direct traffic and assist customers with finding products.